The Duke Blue Devils moved to -3-0 on the season with an 84-46 victory over Eastern Michigan in Cameron Indoor Stadium. Duke used a 20-4 run, one of many, over the last eight minutes in the half to go up 48 to 13 at the break. The Blue Devils defense was suffocating holding the visitors to 21% shooting from the field in the first half. Duke continued their effort into the second half. The lopsided affair allowed Duke to play several players. Zion Williamson led Duke with 21 points while his freshman teammate R.J. Barret added 20. Duke captains Javin DeLaurier and Jack White added 10 points apiece. Both of them also pulled down 6 rebounds each. Duke hustled early on in this game playing great defense along the way. Cam Reddish went out of the game early and did not return but will be okay and was held out as a precaution per Duke coach Mike Krzyzewski. The win for Duke was their 141st straight against no conference opponents in Cameron Indoor Stadium. 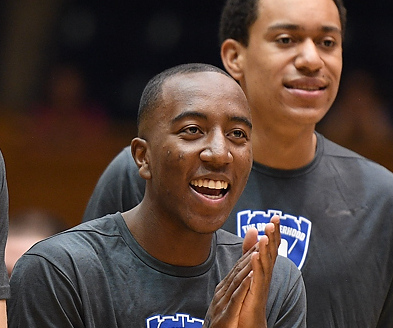 Duke will take on San Diego State in the Maui Invitational on November 19th. The team will leave Friday morning for Hawaii where they will play three consecutive days. Should Duke win the first game they may face top ten foes Auburn and Gonzaga, two of the nations better teams.